The Nevill Pelham funeral hatchment hangs on the south wall, with its motto Ne Vil Velis, (form no mean wish) which is a pun on the Neville name. This is an account of the funeral of the son of that couple. They were George Nevill, 1st Earl of Abergavenny, (1727-1785) and Henrietta Pelham (c. 1725- 1763). She was first married to Richard Temple MP, in 1748, but he died of smallpox in 1749. 4 years later she married the Baron Bergavenny (as the title then was) and had 3 children, before dying in 1763, aged 38. Their eldest son lived to be 88. He was the Rt Hon. Henry Nevill, second Earl of Abergavenny, Viscount Nevill and Baron of Abergavenny, K.T. He died on 27th March 1843, and was buried in the family vault under St Swithun’s church, on 4th April. For the funeral, his body was brought from the family home at Eridge Castle in great state. Six horses pulled the hearse and another six pulled the mourning coach. Three more coaches were each drawn by 4 horses. There were ‘numerous’ other coaches, and retainers on horseback were at the back of the cavalcade, but, according to W H Hills, ‘the grandeur of the display was greatly interfered with by a heavy and incessant rain’. Henry Nevill sold Kidbrooke to the Rt Hon. 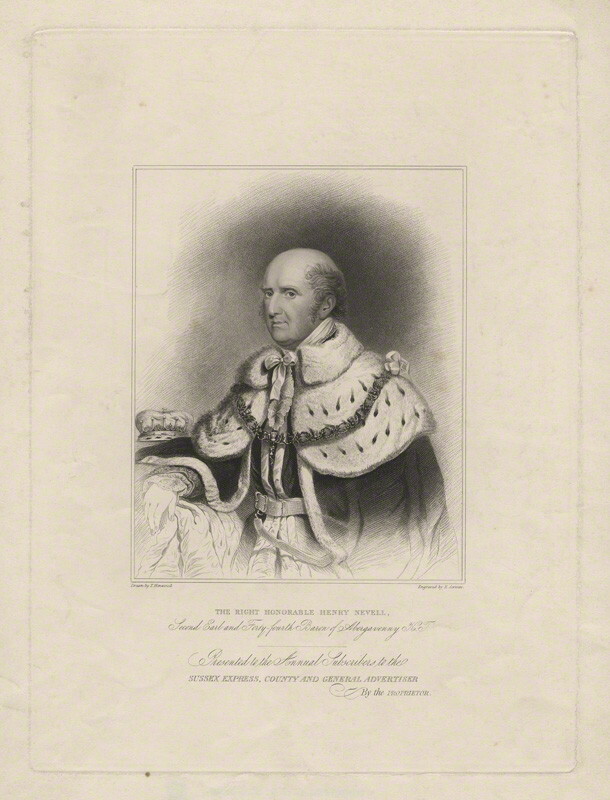 Charles Abbot and moved back to Eridge Castle, one of their ancestral seats, in 1805. The funeral service was taken by the Chaplain to Lord Abergavenny, the Rev’d. Robert Gream, Rector of Rotherfield. He was the father of Ann Gream, the first Mother Superior of the Sisters of the Society of St Margaret. John Mason Neale founded the Society of St Margaret in 1854, whilst he was Warden of Sackville College (1846-66). Ann Gream’s father was by then elderly and needing care, so John Mason Neale rented a house for some of the first sisters in Rotherfield so that Ann Gream could continue to help her father. John Mason Neale regularly walked from East Grinstead to Rotherfield and back- a distance of about 14 miles each way, to visit the Sisters. Once when he travelled by horse and cart, the horse fell and the cart tipped over. He was lucky not to be killed. Soon after this, the Rev’d Gream died and the Sisters took up residence at 8, Church Lane, from Midsummer 1856 until Midsummer 1858. In a letter, John Mason Neale proposed turning the former house of the Sisters in Rotherfield into a ‘cottage hospital’. It is not known whether this actually happened, but it is a good example of John Mason Neale wishing to help people, and being aware of new ideas for helping those in need. So a brief account of a gloomy funeral at St Swithun’s has led this story to the foundation of a Sisterhood, the Society of St Margaret, which did much good in the community, and still does so in Chiswick, in Sri Lanka and in Duxbury, Massachussets.